Thought Leader: Rob Starner, Ph.D.
As a professor of Greek and New Testament at SAGU, I naturally champion the study of Biblical languages so here are 7 reasons why the original Biblical languages hold great promise for those who consecrate their time and effort to learn them. 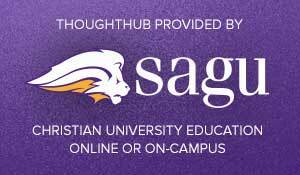 Should Christians study the biblical languages Greek and Hebrew? In this blog video, Rob Starner, Ph.D., discusses seven reasons why it is extremely important for Christians to study the original languages in which the bible was written. 1) Hebrew, Greek and Aramaic are the ONLY languages that God chose to communicate His inspired word. The orthodox doctrine of the inspiration of Scripture has always been restricted to the original Hebrew and Greek manuscripts as penned by the Biblical writers (or their scribes), not to copies or translations of these documents. Reading the original Biblical languages is like hearing the voice in person, as opposed to listening through a distorted, cracking and hissing AM radio station. 2) The single, most important, starting point for biblical exegesis is grammar. Our primary concern must be with the grammar of the original language, not the English translation, and for this we need to know the original Biblical language. A text simply CANNOT mean what the grammar of that text does not support. 3) Knowing Biblical Hebrew and Biblical Greek unveils the interpretive options of a given text—and assists in properly adjudicating among them. In the Greek language the genitive case alone has over thirty different grammatical functions, of which translators must choose only one in any given occurrence; English readers frequently have little clue what possibilities the translators rejected. Certain passages of Scripture have multiple possibilities for meaning. Some translations footnote (usually one of) the grammatical options, but many do not. When, say the King James Version differs from the New International Version, how will you determine which of them gives the best sense? "Gut feeling?" "Holy Spirit Woosh?" Urim and Thummim? For this, readers need a knowledge of the Biblical languages and access to grammars, lexica, and scholarly commentaries that deal directly with the original text, little of which will make any sense to those unschooled in Biblical languages. 5) Reading the text in the original Biblical languages develops and reinforces a careful, detailed hermeneutical approach. Having to establish the precise use of a case or mood or voice forces the interpreter to consider all the various possibilities of meaning inherent in the language of the text. When it comes to hermeneutics, attention to detail often brings a huge exegetical dividend from this investment. 6) Reading the Biblical text in the original Hebrew or Greek languages also identifies the authors' emphases. Here we think specifically of rhetorical features, such as alliteration, assonance, poetic structure, chiasm, marked/unmarked word order, and the like, most of which are completely lost in translation—but all of which are clearly discernable to those schooled in the Biblical languages. 7) Learning the Biblical languages is a crucial antidote to hermeneutical arrogance. Grappling with texts in their original Biblical language repeatedly calls our preconceived notions about the meaning of these texts to account; it checks unfounded certainty and preformed conclusions. Congregations naturally put their trust (often, sad to say, blind trust) in their spiritual leaders—and sometimes for very laudable reasons. But this does not obviate the danger of such a practice, and it certainly makes preachers and teachers of God's word all the more responsible for "cutting a smooth path for the Word of Truth" as Paul says in 2 Timothy 2:15. What do you think about this? Do you think it’s important to study biblical languages? If you could choose a biblical language to study, which would it be? Let us know your thoughts by commenting below. Article by Mid-Atlantic Christian University: What is the Payoff for Studying Biblical Languages?